Having a good sense of hearing is imperative in life as, without sound, we would not be able to carry out tasks effectively on a day to day basis. 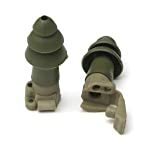 Ear protection for shooting is extremely important because guns create a high decibel sound when fired which may lead to hearing loss in the long run. It is not possible to reverse the effects of hearing loss once they set in because it is permanent. Therefore, it is very important to take care of your ears while you are out for a hunt or during the course of regular shooting practice. There are a lot of factors to be considered when it comes to choosing the right protective gear for your ears while you go out for hunting as a shooter is exposed to the sound of pistols and big-bore rifles which can create a noise higher than 175 dB. In this article, we will take you through the various causes by which guns can affect your hearing along with the need to protect your ears and using the right gear to prevent hearing loss. The sound is measured with the help of a unit termed as decibel (dB). The higher the decibel, greater is the amount of noise generated. While a conversation between two or more people can generate a sound of about 60 dB, the sound created by guns of different types can vary between the range of 156 - 160 dB which is even greater than that of a jet plane taking off! People who use guns regularly are more prone to suffer from hearing loss and other hearing-related issues such as tinnitus. Even the reverberation caused by a gunshot is capable of causing hearing loss to the shooter as well as to the bystanders. Many guns come loaded with a recoil compensator and other add-ons. These accessories create an even greater sound and cause more damage to the ears. Typically, the ear which is closer to the muzzle experiences more damage than the other ear since it is not protected by the head shadow. Research has proved that a prolonged exposure to noise levels above 85 dB can cause a permanent hearing damage which is also known as a noise-induced hearing loss. Our ears are equipped with fine hairs that are responsible for stimulating the auditory nerve fibers. High sound levels destroy these fine hairs leading to hearing loss and associated damage. There are various problems associated with not being able to hear well. If you are a hunter, then a hearing loss will lead to problems during hunting and you may not be able to concentrate well on your target due to noise issues and lose the game. People with a noise-induced hearing loss find it difficult to listen to high-frequency sounds which makes communicating and socializing with people more difficult and challenging. Such people face more problems while communicating with women and children as their sounds fall in the high-frequency range. The second problem associated with hearing loss is tinnitus. We have all experienced a whooshing or buzzing sound in one or both of our ears for a few seconds sometime during over lives. Imagine how frustrating it would be if that sound never went away! Tinnitus is exactly what we are referring to and the sounds could be low or high pitched. Hearing loss is irreparable and irreversible once it sets in. Thus, it is very important to take the help of appropriate protective gear that would help to keep your ears from harm and provide adequate noise control. We have already covered the part on how you could suffer from a noise-induced hearing loss and other associated risks if you stay exposed to high levels of noise. It has been noted that only 50% of people who go out for shooting and hunting actually use the protective gear designed to protect their ears. Repeated and continuous use of firearms is capable of inducing a permanent hearing loss over the course of time. Noise levels of 140 dB and above are extremely harmful to the human ear and therefore it is necessary to care for your ears while you are out hunting. If you are target practicing indoors, the damage is even greater as sound has the capability of ricocheting among the walls and resonating for a long time when compared to outdoor shooting. Large rifles can produce a sound that is approximately 25% more than that of the other guns. Professional shooters stand the risk of losing some part of their hearing capabilities in the long run despite using protective gear if it is not worn correctly. At the same time, one ear may face greater damage than the other based on its proximity to the muzzle. Loud noises are harmful to our ears and can cause hearing loss if we stay exposed to such high decibels for a long period of time. In order to prevent that from happening, we must take good care of our ears while shooting. There are many types of protective gear available in the market today that help in reducing the background noise and provide good protection for your ears. These include gear like earmuffs, analog and electronic earplugs. The most common form of hearing protection used in everyday life is the passive hearing protection system. These comprise of soft earplugs that can be fit in the ear and block external noise from the surroundings. Since they just block noise by occupying the physical space in the ear, they are not great for providing protection for an extended use. Earmuffs, on the other hand, are a better option when compared to earplugs because they help in eliminating the background sound effectively. The best type of protective gear for ears are noise-canceling electronic earplugs and earmuffs. They help to reduce the noise level with the help of electronic technology and does not cause any damage to the ears. At the same time, these electronic earplugs enable a person to listen to what is happening in their surroundings. It blocks the high decibel noise and lets one hear general sounds like a conversation and the sound of people approaching. Some guns are capable of producing a lot of pressure when fired. This pressure can cause hearing loss by damaging the bones present behind the ear. This can happen even if the ear canal is protected by an earplug. Hence it is essential to recognize and choose a high-quality gear that will protect your ears even in an indoor setting. These are the simplest and cheapest way to protect your ears. They have a noise reduction rating of 25 to 33 depending on their type and are capable of providing good protection to your ears. While they are inexpensive and small, they also provide limited protection since they just cover the ear canal. This leaves the bones outside the ear canal vulnerable to damage from loud noises and can cause a damage to your hearing despite the protection. These earplugs also block out all the sounds from the environment which will leave you lost and incapable of paying attention to what is happening around you. This is a major drawback especially when you are out hunting. These are a modified version of the normal earplugs since they are reversible. The reversible feature allows passive protection for continuous noise and a noise-activated protection for a momentary sound like the shot of a gun. The best part about using these earplugs is that they allow the user to listen to the sounds from the surrounding when the noise-activated protection mode is being used. This is a very big advantage for hunters who need to keep a tab on any unusual movement in their surroundings. Earmuffs are a better choice than earplugs for people who use guns regularly. They have a noise reduction rating of about 30 and provide an effective protection to users. They are simple to use and do not require any additional assembly. They also help to protect the delicate bones close to the eardrum and thus help in providing a complete protection to the ears. However, they are awkward to wear with the headgear and may get in the way. 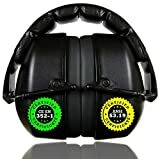 These are an excellent option for blocking loud noises and amplifying other sounds present in the environment which enables a user to have a clear focus while shooting. They can be used both while hunting and during simple target practice. The drawbacks are the same as that of simple earmuffs in terms of a good fit and usability. They also have a noise reduction rating of 22 which make them redundant for use while they are used indoors. 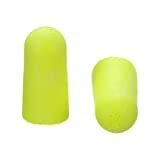 These earplugs offer the same protection as that which is provided by electronic earmuffs albeit in a smaller size! Some models also give the user the freedom to adjust the sounds in the environment and amplify specific sounds. The biggest drawback of these earplugs is that they only protect the ear canal and not the bones that surround it. Thus they are more suitable to hunters than shooters. At the same time, they are expensive and not many hunters may want to buy them. We have already explored the need for using protective gear for ears while you are out hunting or shooting using guns. Technology has made it possible to have some great innovations in this field which ranges from all levels of costing and features. Paying adequate attention towards protecting your ears is a must if you wish to safeguard yourself from the danger of hearing loss and other hazards. There isn’t a lot of difference on how guns work. The major difference lies in the type of primer ignition system used in the gun which leaves beginners in a fix as they constantly wonder about the better primer ignition option between rimfire vs. centerfire. The functioning mechanism of guns is the designed on the same concept. A powder charge is filled in a pipe that is sealed from one end. An ignition in the powder charge stimulates an explosion where a projectile is launched from the sealed end of the pipe. The question of choosing one ignition mechanism over the other depends on the purpose for which a gun is going to be used. These activities include using a gun for hunting or simply learning to shoot at a shooting class. Modern bullets use one of the two primer ignition systems - rimfire or centerfire where each mechanism has its own purpose and uses. The major difference between these two ignition mechanisms is their design and method of operation. We will be exploring the details of rimfire vs centerfire in this article and help you understand the niches in which they operate along with their working mechanisms and differences. A rimfire cartridge was first used in the year 1845 and was made by evenly distributing the primer inside the rim pipe. It worked wonders as the cartridge was one-piece and did not require any assembly before firing. The single piece structure also helped to prevent the entry of dirt, dust and moisture inside the cartridge and made it very convenient to use. Rimfire design faced two major challenges during the initial period. The first was to distribute the primer evenly at the base of the cartridge and the second was the need to utilize a soft metal for the construction of the rim. The rim was needed to be created out of a highly malleable metal so that it could be dented easily by the firing pin. Copper was the most preferred choice but it came with a disadvantage - it was not possible to load a highly powered load because of the risk of a blowback. Rimfire technology was used during the Civil War in the Spencer repeating rifle which fired a .52 caliber rimfire bullet. Even though the bullet speed was low, it was capable of inflicting major damage wherever it hit. It also displayed a capacity of firing 20 to 30 shots per minute which were way superior when compared to other guns used during that time. Centerfire cartridges were invented close to 1812 much before rimfire cartridges were discovered. However, they were not quite reliable to use and continuous changes were made to its design until it was finally perfected during the year 1855. It started gaining a lot of popularity and was used as a standard ignition mechanism for both rifles and handguns by the year 1860. It comprised of a primer cap which was placed at the center of a cartridge which was made out of brass or copper. It was possible to construct the cartridge and the primer cap using different materials as the primer cap was an external component and could be fit into the cartridge separately. This enabled the makers to construct a stronger cartridge which could be dispelled with a greater velocity and could be used on bullets of all sizes. An issue that cropped up with using separate metals was sealing. It was very difficult to seal two different metals together so that they could be extremely cohesive. This gave space for moisture and dirt to enter these cartridges and made them difficult to use. The solution to this problem was found in the form of lacquer which was used to seal the different metals tightly and prevent the entry of foreign particles inside the cartridge which could compromise the ammunition. The result was a highly developed and effective ignition mechanism that was safe to use and could fire at a long range. We have already taken a look at rimfire and centerfire cartridges and their mechanisms along with their construction aspects and invention history. This has shed light on the fact that both of these cartridges are not the same and come with some differences which are spotted in their design and operating mechanisms. A rimfire cartridge has a lower power and thus can operate well at a closer range. Though modern technology has enabled the use of different metals and alloys in their construction to make way for a longer range, the cost factor shoots up and they are not as effective as centerfire cartridges. Centerfire cartridges can be reused multiple times by replacing the primer cap. This factor increases the cost of these cartridges but one can avail the economies of scale in the long run. A rimfire cartridge, on the other hand, is inexpensive but cannot be reused which makes it an expensive affair if you use it regularly. Rimfire cartridges are available in .22 caliber shots whereas centerfire cartridges are available in almost every caliber size. This has made it a favorite with the police forces and the military who use ammunition and are constantly in need of better weapons and equipment. Centerfire cartridges are also extremely safe to use and a shot with a higher caliber too is not as dangerous as it would be while using a rimfire cartridge. The primer pipes are completely sealed and are impervious to moisture and dust particles. The working mechanisms of rimfire and centerfire cartridges are different and it is essential to know them as they will help you pick the best cartridge which is suited to your needs. Centerfire cartridges have a separate primer cap which is attached to the center of the rim pipe. This enables an even ignition when compared to the rimfire cartridge in which only a part of the gunpowder is ignited despite it being evenly distributed throughout the rim pipe. The self-contained primer also makes centerfire cartridges more reliable and easier to shoot even while using high caliber models. Hence these cartridges are more suitable for military use and for self-defense. A rimfire cartridge is more suited for hunting and practice purposes because the primer casing is built into the cartridge which makes it more susceptible to manufacturing defects. At the same time, a shot fired using a rimfire cartridge is more accurate as it generates lesser recoil when compared to a centerfire cartridge. The general firing mechanism of a gun is based on the ignition of the primer. The explosion caused by igniting the primer will propel a bullet forward and help it to reach its target. This happens every time a gun is fired regardless of whether it is a rimfire cartridge or a centerfire cartridge. When a centerfire cartridge is used, the explosion takes place at the center since that is where the primer is placed. This leads to a greater degree of efficiency and consistency and the bullet is fired with a greater velocity. While rimfire cartridges are best suited for hunting game and close range targets, it is difficult to lay your hands on one because of their limited availability. They are also prone to manufacturing problems which may lead to misfires and accidents. Thus it is not advisable to use them for self-defense. A centerfire cartridge is widely available. While a rimfire cartridge is popular in the .22 caliber rifle, the centerfire cartridge is available in almost every other caliber size. It is very safe to use and is hence in great demand in police forces and military. Centerfire cartridges can also be used for a number of times which raises the bar for other cartridges. Multiple uses of a single cartridge helps to even out the expense of buying a centerfire cartridge which makes it a profitable investment in addition to being highly safe and effective. While comparing both types of ammunition, it is quite easy to say that centerfire cartridges are safer and more reliable when compared to rimfire cartridges. They are designed superiorly and are widely available today due to their use in almost every other rifle and handgun available to us. As we compare the differences it is imperative to note that rimfire cartridges are on a decline whereas centerfire cartridges are the future. The use of a primer cap instead of a compound make centerfire cartridges more reliable and safe to use and the boxer design makes it very easy to extract a used primer and replace it with a new one. While the reloading feature is available in rimfire cartridges too, it can be done only by using a specialized kit designed for this purpose. At the same time, the procedure is complex and needs delicate handling which makes it time-consuming and not worth all the effort.